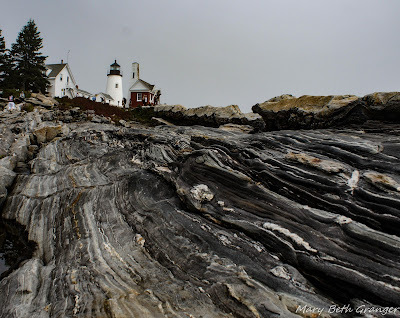 I had seen beautiful photos of the lighthouse at Pemaquid Point and was anxious to try my hand at photographing the lighthouse and the shoreline with the beautiful rocks. We drove north on Hwy 1 in Maine until we reached the town of Damariscotta. 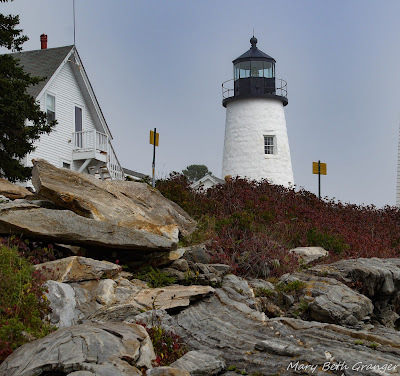 We then took hwy 130 till we reached the end of the point and Pemaquid Lighthouse. When we first reached the point the fog was very thick, but I got out of the car and started to explore the grounds. There were lots of beautiful flowers, an art gallery, a fisherman museum, and beautiful scenery in addition to the lighthouse and keepers house. 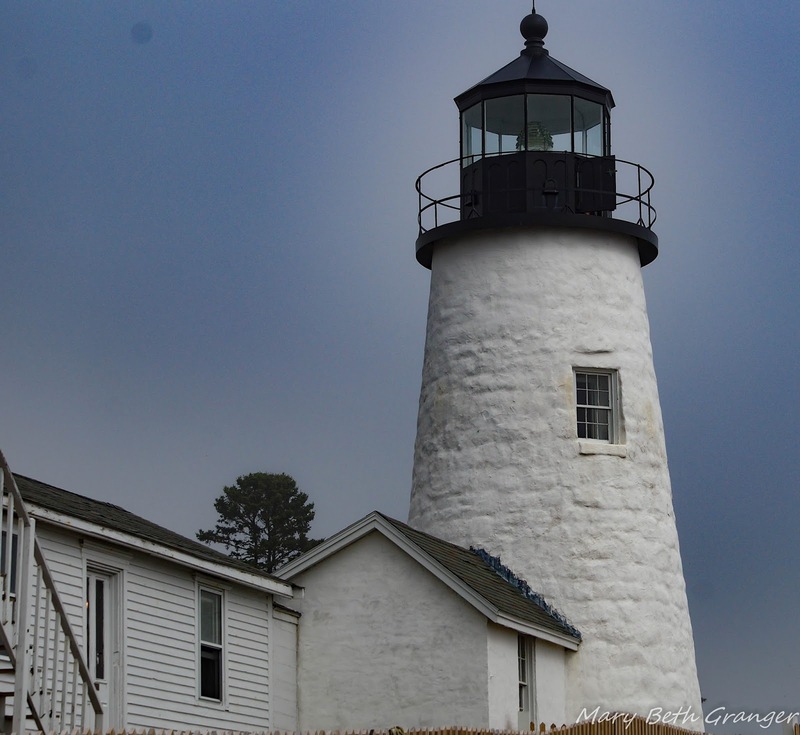 It is one of the nicest lighthouse areas I have encountered on my quest to photograph lighthouses. 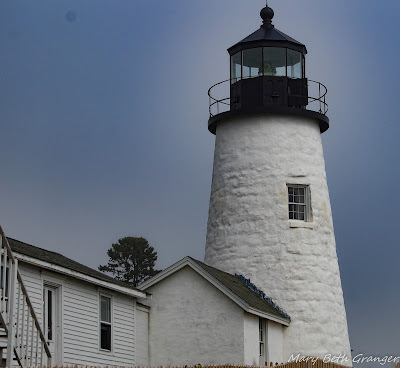 After my exploring the fog began to lift and I captured the lighthouse from various angles. One of the great features of Pemaquid Point is the beautiful rock formations. Leading up to the lighthouse is a "frozen wave" rock formation that reaches down to the end of the point. I had seen the photos and wanted to capture the rocks leading up to the lighthouse. What I didn't realize is that the only way to capture that look was for me to climb down the hill on the rocks. I stood and looked at it for a bit and then decided to go for it. It was definately worth the climb. There were lots of little flowers blooming in the cracks of the rocks and the entire scene was wonderful. The climb was a little scary at first, but then it was not really too hard. The lighthouse stands 30 feet above the ground and 79 feet above sea level. In clear weather the light can be seen for 14 nautical miles. The white light flashes every 6 seconds and automatically turns on and off at dusk and dawn. 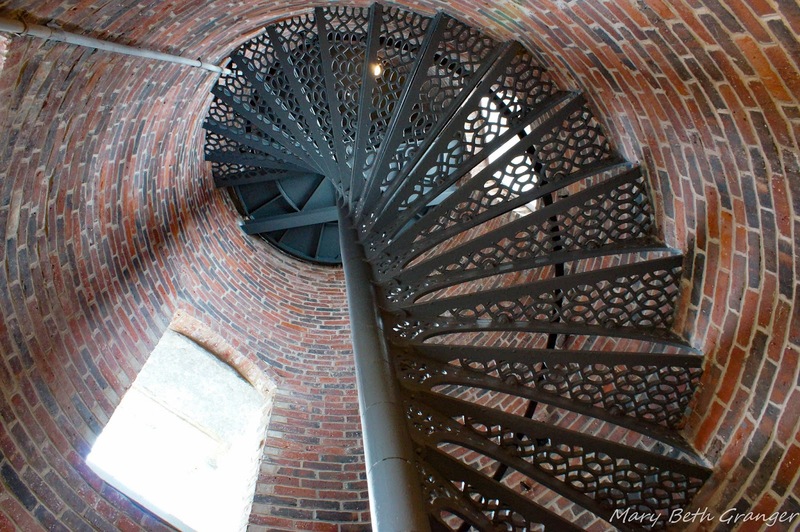 Winding stairs take you to the top of the lighthouse which is open to visitors.